How long have you be in C_C? What Country and state do you live in? What do you like most about this guild? How long are you usually on per day? Have you ever recruited anyone that passed requirements? Why do you think you'd make a guild officer? "We need to recognize that we are not the ultimate species on this planet and realize that we all are interconnected - if one species is pushed into extinction it has a ripple effect that will ultimately affect us all." I have been in the Core for about 2 weeks now. I love it that it is so active and very helpful. I have been in other guilds and none were as active as the Core. I am usually on every day including weekends. For about an hour or so in the morning. Then agian from about 7-11 at night. I have not recruited anyone as of yet. Since a bit before the beginning of summer. Early June 2008. Yeah. I've recruited a few. I don't think Kiev counted as passing requirements at the time, but I'm pretty sure he counts. Spaceboy was the most recent. I don't really remember who else I recruited, as they're all members in my eyes, at this point. I don't know if Dropshot or Flash count, as they both left. Dropshot at least played for a really long time with us.... Hopefully I can recruit more soon. I don't remember most of the reasons I made last time, and I'll try to make it much quicker, as everyone else made their applications much more brief. Basically, I've been in here for a really long time, and everyone knows that I'm not going anywhere. I have experience with running clans and stuff, as I have been the leader (with Kiev) of an America's Army clan until recently, when I gave up that game to play Shaiya. I've also been officers here and there in some other clans. I feel that I'm generally respected by everyone in the guild (I think). I try to be as helpful as I can possibly be with all the stuff that I know the answers to/can help with. Above all, I'm extremely devoted to the guild, and am on for a significant portion of the week. 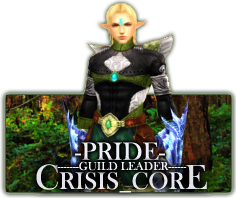 I've been trying to spread the Crisis_Core name (in a positive way) in Trade Chat, Shaiya's Forums, and anywhere else I carry the C_C tags in. Oh yeah, not to mention that I'm paying for a ventrilo server and I created these forums xD. Honestly, I stopped myself from writing any more. I could honestly write forever about the guild. Why do you think you'd make a guild officer? I'm honest I do have experince as a guild officer i use to play everquest. Why do you think you'd make a good guild officer? I would be a good officer because I can keep people in line, sonetimes I may be a bit strict(for example when queen left the guild due to an arguement with another clannie, i wouldve have had them resolve it or they both get kicked) I led a guild alone on WoW, and we numbered well over 300 people. Ive been managing guilds in other games as well, and I can tell when a person is lying usually,even if were chatting online. I realize that with the fact that im currently inactive on shaiya I may not be the ebst choice, but I will be back on shortly if all goes well. Alts: Non Until i'll get to lvl 50 with my NM. Class: Fighter , Further Mage in HM. How long have you be in C_C? : about 1 Month now. What Country and state do you live in? : I Live in Denmark , In the City called Randers. What do you like most about this guild? I Like that every1 like to help each other , and that we are able to work together. Have you ever recruited anyone that passed requirements? i've recuited around 3 ppl for the guild so far . Well, I've been in the guild a while so might as well pitch in to the batch of applicants. I'm realistic, considerate, fair, and most importantly, loads of fun(Pride, you of all people should know that *nudge nudge* XP). I've also played many other MMO's and get the general gist of most things that go on. I can contribute good knowledge and experience in game, in life, and ofc in anything math or physics related. XP And if I don't know something, always glad to learn or be willing to find the answer. First set will be picked today. Good luck everyone. If anyone has something strong to say about one of the applicants, please PM me with them. The chosen officer(s) for this week will be announced during maintenance. My new copy of shaiya just finished installing! So pridey, I guess you can consider me now. EEK! Must install new client from the homepage! oh noes! WOO! downloading thr file, from the launcher! Yipee! Gaotz h1tman, though honestly I can't say I'm surprised.